Farmersgirl Kitchen: Lemon Love Cakes! As a special treat, I am offering you a little 'Lemon Love Cake' which I hope you enjoy. 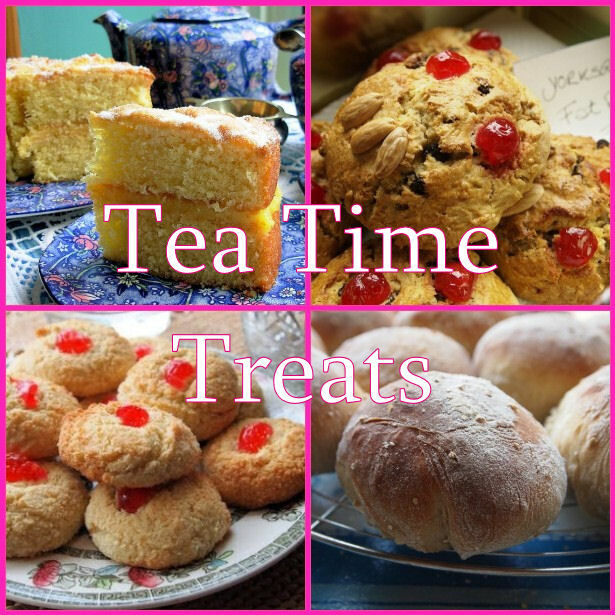 I'm entering this in the February Tea Time Treats Challenge run by Karen at Lavender and Lovage and Kate at What Kate Baked, Kate is hosting this month and has gone all 'Romantic'! I'm also entering it for the new Alphabakes challenge run by Ros at 'The more than occasional baker' and Caroline Makes the letter is 'L' and that means Luuuurrrve! 2. Cream the butter in a bowl until soft. Add the sugar and lemon zest and beat until fluffy. Add the beaten eggs a bit at at time, then add the sifted flour and baking powder into the mixture. 3. Divide the mixture between the paper cases and bake for 7-10 minutes, until risen and golden. Remove cakes to a baking tray and let them cool completely before icing. 1. Cream the butter until soft, sift the icing sugar into the butter with the lemon zest and enough lemon juice to get the right consistency for piping or spreading. 2. When the cupcakes have cooled completely, put the butter icing into a piping bag with a large star nozzle an pipe swirls onto the cupcakes. Alternately, spread a large teaspoonful over the top with a palette knife. 3. Sprinkle some love over the cupcakes in the form of some little pink hearts! As an aside, I went to get my camera to take my blog photos and my husband nearly took off with one of these cupcakes, so they obviously work! Janice, I think that it's Kate's turn to organise the tea time treats this month (at What Kate Baked). I just love your icing I can just imagine the sweetness mixed with the lovely tang of the lemon - delicious and beautiful. Thanks for that, I've changed the link to What Kate Baked! LOL! It is the ROMANTIC Kate that is hosting this month Janice! 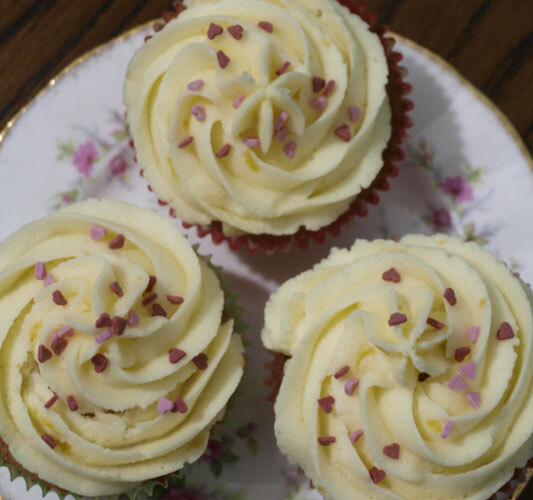 LOVELY wee cakes and PERFECT for tea time treats too! Those look great. With all those fancy flavoured cupcakes around, it just shows that oven the old-fashioned flavours are still the best. 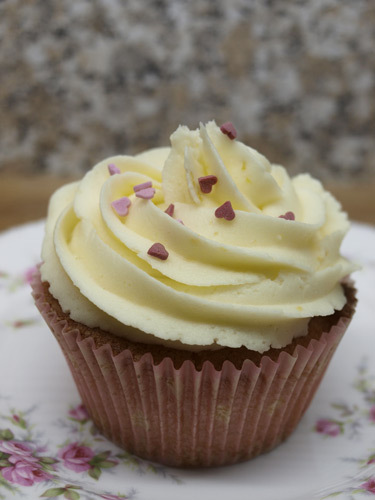 Lemon is one of my fav cake flavours and your icing is perfect! I've got a long list of things I want to bake and this recipe is also now on that list! Thank you so much for entering these to AlphaBakes. They look LOVELY indeed. I LOVE Lemon cakes and I'm not surprised these were disappearing quickly. PS i've baked something similar for alphabakes and TTT - clearly, great minds think alike! :) Will post tomorrow hopefully. What lovely, lovely cupcakes Janice- the icing looks so lush and professional. 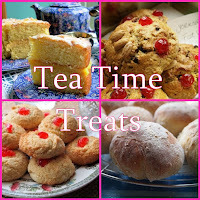 Sorry its taken me a couple of days to come over and admire them- and thank you very very much for entering them into Tea Time Treats! Love lemon! Comes a close second to chocolate I think!